Comment: Sealed item. Like NEW. Amazing story!!!! To all ages to see and to learn!!! 5.0 out of 5 starsPlease release in a North American/USA format!--DONE: August 2015 - Amazon Instant Video! When will this be released in a USA format? I love the trailers. A family member saw it on a transcontinental flight and said it was excellent. From the "buzz" I've read, a lot of people would like this released for a North American audience. Update August 2015. This has now been released on Amazon as an Instant Video to rent or buy. I saw it and thoroughly enjoyed it. I predict it will become a classic in family fare and be of great interest in special needs venues. It portrays many great values including renewal, loyalty, and determination, plus gorgeous mountain scenery. This is a great film. This is a French drama about Julien Amblard (Fabien Héraud), a differently-abled, 17-year-old boy who dreams of adventure, and his father Paul (Jacques Gamblin) who has recently lost his job. Knowing that his emotionally distant father was a triathlon athlete when he was young, Julien enters the "Ironman" triathlon in Nice, and asks his father to accompany him in the race. 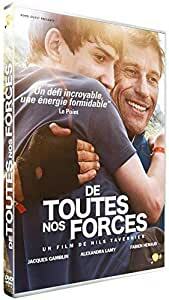 What follows in “De toutes nos forces” (“The Finishers”) is unashamedly sentimental, but it works thanks to the effective performances from veteran Jacques Gamblin and non-professional actor Fabien Héraud. Director Nils Tavernier keeps the film moving at a slick pace throughout, and though the storyline itself is predictable, the conclusion of his father-and-son drama is very moving. With likable characters and credible competition scenes, “De toutes nos forces” is a winner.